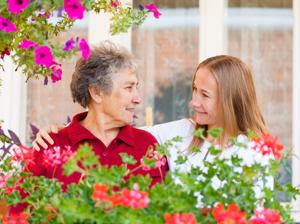 Help your clients with dementia dress more easily with these tips. There are many companies that sell adaptive clothing for seniors with dementia. These can include items that make it easier for the seniors to dress independently, like clothes with Velcro or zippers rather than buttons. You can also find clothing that seniors will have a hard time removing for those who tend to take off items of clothing in inappropriate settings. To make the process easier for everyone, talk to your clients or their families about downsizing the seniors' closets. Keep solid-colored basic clothes and buy multiples of any items the senior loves to wear. You want your clients to feel as independent as possible. Have them choose between two outfits, then lay their choice on the bed, arranged in the order they'll be putting the clothes on. Offer to give them privacy, but stand nearby in case you need to intervene at any time.